Make a lasting memory with your employees or customers! 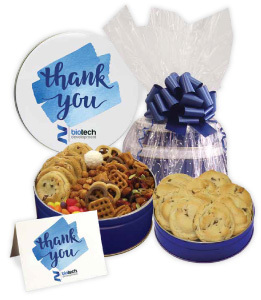 Send our fresh-baked delicious gourmet cookies and treats in a tin customized with your company logo, photograph, or four-color artwork. 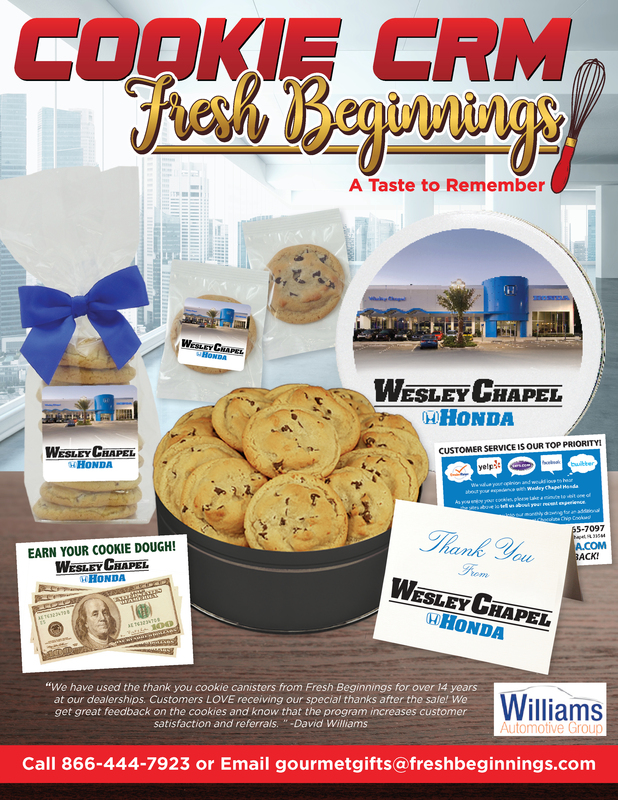 From our Cookie Program for Auto Dealers to Corporate Gifts, we have everything you need. Add your logo or design to one of our tin lids or labels here. Better than a cookie gift basket, your tin of cookies and treats will leave a lasting impression well beyond the last bite. Loyalty Appreciation Programs are the perfect way to complete the customer experience and drive profitable repeat buyers and referrals into sales and service. No Contracts. No Minimums. Service and special event gifts are also our specialty! Give a small treat as a service “thank you” or to your showroom/lot prospects. Tent Sales, Grand Openings, and Holidays are always a popular time to show your appreciation. We are waiting to make the perfect personalized gift for your business. View our Corporate Gift Catalog at http://freshbeginnings.ecatalognow.com or call one of our Fresh Beginnings corporate account managers today at 866-444-7923. You can also fill out the form below and one of our account managers will contact you as soon as possible.